Refurbishing PSB Image 6Ts - sanity check! Don your help here is really outstanding, and so useful to me. > Cori, were you planning on running them as BiAmp or single amp. There is still the issue of low impedance. It will be a single amp setup. As far as I can tell, the amp has a 6 ohm minimum impedance. Thank you so much Don! I realized I mis-spoke on the tuning in the earlier post. The graphs are correct for a 10cm long tuning port. You measured the Image6T and its has 20cm long tuning ports. I've included the hornresp data file as well if you want to try it. So I don't know how easy it is to replace or cut those port pipes. I provided the comparison graphs for both the 10cm and 20cm port lengths. Unfortunately the sim shows the bass will be worse if the ports are left at 20cm. Cori, did you have a tweeter in mind? I have a suggestion to get the impedance closer to 6ohm min for your amp to drive. This option keeps your speaker a 2.5 way design. It's most likely the original drivers were higher impedance. Keep in mind that for a given voltage the lower impedance woofer will output more than a high impedance woofer. You can install all 3 woofers but only drive 2 of them. The bottom woofer would not be driven. 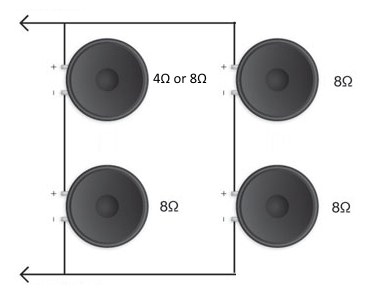 I've updated the XO schematic that rebalances the system for 2 woofers. Two resistors are added (after the XO board) to match the midbass and tweeter levels to a single woofer. I should add that the effect of the ported woofers and baffle has not been included yet but it will not change the min impedance. The system impedance dips to 5 ohm at 2 points with the changes. In reality it will be a little higher due to speaker wires and various losses. That should be close enough to meet the 6 Ohm min drive requirement of your amp. The other ways 1) find drivers that are higher impedance, or b) bi-amp the system, or c) use an amp that can drive 3ohm speaker. Don this is really excellent stuff, and very helpful to me. Unfortunately the sim shows the bass will be worse if the ports are left at 20cm. It's fascinating to me that such a small change could have such a large impact on sound quality. Yes, it will be possible for me to cut the ports to size, but I'll leave that until I know how to proceed with the crossovers and tweeters. Thank you so much for this observation! There are two candidates, which should fit with the speaker's mounting bracket and curved fascia. I can see it'll come down to impedance. Options A through D are either too high or too low. So that leaves options E through H - though I'm thinking there is something really big I haven't seen here. I know that each of these options means that whatever's on the same series line as the tweeter (I assume the bass driver) will get the same power as the tweeter. This may screw things up because the tweeter and the woofer will have different SPL sensitivity (i.e. 94.1dB for the 8 Ohm tweeter vs. 89dB for the woofer). I'm very impressed with the amount of knowledge on this forum - especially the level of technical expertise that members have for what is essentially the beauty of listening to music. It's really humbling. I have a suggestion to get the impedance closer to 6ohm min for your amp to drive. I really appreciate your lateral solution here! I do think it is a very clever solution but I think I should try as hard as I can to build a unit that sounds good and has all 3 main drivers firing. I know I'm going to have to replace the original crossovers anyway - and I'm not sure how well that's going to go - but I'd like to try if I can. It's most likely the original drivers were higher impedance. So based on your comment here, I spent some time trying to hunt down details of the original drivers. The only impedance rating I can find is 9.5 Ohms for the W6-14PP 12S/P drivers! You were right Don! How about modifying the crossover to make it a true 3 way. That way only 2 woofers are active at low freq where the impedance problem is. The midrange only comes in later on when its needed and it keeps the speaker impedance higher. These changes could be easily done with minimal cost. The impedance is still around 5 ohm min and will probably be a bit higher when wires are included. I've attached a screen shot from Xsim. The issue with trying to create series connections of drivers is that the inductance increases and that limits high frequency. So you can't put a tweeter in series with a woofer. The drivers are effectively all in parallel but they are individually active in different frequency ranges and so you need to consider the complex impedance (R,L,C) rather than just DC resistance (R). I'm still assuming you want to use the Jaycar woofers you bought. 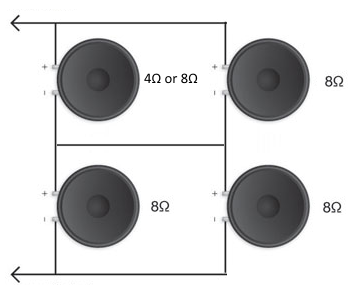 It's possible to put two 4 ohm woofers in series as well, but you'd need to buy 4 more woofers. Jumping in late here. Do you have 4 or 6 of the Jaycar drivers? Did you buy them because they fit in the original holes? I ask because my personal opinion of these is not great where the midrange is concerned. QUOTE" The more I know, the more I know, I know (insert maniacal laugh >here<) NOTHING"
How about modifying the crossover to make it a true 3 way. That is an enlightened idea! I also very much appreciate the explanation for the woofer/tweeter problem. That makes a lot of sense. I'm very grateful for your sage advice, Don. I'm still assuming you want to use the Jaycar woofers you bought. I've thought about your comments here, Don, and those of Moondog55 below (Hi Moondog55!) and I'm seeing a lot of upside to swapping out the Jaycar woofers for something that might sound better, be easier to engineer impedance-wise, but hopefully won't break the bank. Do you have 4 or 6 of the Jaycar drivers? I have 6, to replace the original 6 PSB drivers. I did but also because they were accessible at the time, and because I don't think I really knew what I was doing. I realise I should have come here first before I made a move. I guessed that might be the case. Hmmm. How bad is not great? I don't really want to buy new drivers, but then again I don't want the speakers to sound awful after all this. Which drivers would you recommend? I don't know which drivers might also alleviate this impedance problem. I think being able to use the original crossover would be, well, terrific. As a woofer I think they are OK although I do hope you got the bulk discount. I also assume that there is a limited budget . I've not used it myself tho, only listened once. The paper coned Peerless 830657 is the one used in Paul Carmodys "Tarkus"
. I think being able to use the original crossover would be, well, terrific. If only it were possible to do this and still sound good, but most times it can't be done. There might be a work-around if there was a spare stereo amplifier sitting around. The original crossover (or a replacement stock one) will have to be modified in all cases because you can't get exact replacement drivers. The Xsim schematic shows the additional parts required. I have tried to place the additions either before or after the existing crossover parts to make the modifications easy. The crossover additions are relatively low cost, and you have the Jaycar drivers already (sunk cost). Why not give them a try. If you don't like the sound, you can swap out the midrange driver later and see if you prefer the new sound.